Travelling the world is a dream most people struggle with, trying to figure out how they must go about fulfilling it. Many take world tours through the plethora of travel services available today. However, try something unique-visit the seven wonders of the modern world! The easiest agenda to follow would be to travel from West to East. It would be convenient to begin in November since the first site to visit from the West is Chichen Itza, Yucatan Peninsula, Mexico. The climate during this time would be pleasant with soft sunshine, and warm winds to caress your face while you explore the city. Chichen Itza is a quaint city with a rivetingly rich history, intriguing monuments and an enthusiastic culture. The Mayans, an ancient tribe inhabited Chichen Itza hundreds of years ago and most of the magnificent architecture that adorns the city today dates back to their times. It is one of the most visited archaeological sites with millions tourists every year. One of the most striking sites was the El Castillo or the Temple of Kukulkan. It is made up of light brown, pastel textured stones with four walls and stairs leading up to a flat top or roof. It looks absolutely surreal when it glistens against the fierce sunshine that the peninsula receives throughout the year, every day, irrespective of the season. ‘Kukulkan’ is believed to be a divine teacher whom the Mayans revered for his unparalleled vision and knowledge.The temple is the epitome of the architectural and astrological brilliance of the Mayans. From Mexico, going to Rio de Janeiro, Brazil wouldn’t be a challenge since the weather is almost consistent. However, climbing up the steep roads of the Corcovado mountains could be quite a task. The lush green mountains surrounding the colossal white statue of the ultimate protector, Jesus Christ, is overwhelming. The statue is hardly visible on cloudy days with thick clouds engulfing the upper portion of the snow white structure. However, on a clear day, the statue can be seen in all its glory. The statue was built to commemorate 100 years of Brazilian independence from the Portuguese. Next destination- Machu Picchu, Peru. It is one of South America’s most peaceful travel destinations. The silence on the top of the mountains where one can only hear the leaves rustling and the winds whistling is rejuvenating and feeds the soul. Dense vegetation, a mind boggling variety of flora and fauna and less number of visitors (since the government has put a cap on the number of annual visitors) makes it a surreal experience. Visiting the Roman Colosseum after Peru was a welcome change since one might start craving for city vibes after spending an adequately long period in all kinds of natural surroundings. The humongous Colosseum may leave you awestruck. It would also be a great idea to visit the Vatican museums and the Sistine Chapel too, since you wouldn’t want to miss out on any of the wonderful experiences which would give you a taste of Italy- which reminds me of all the scrumptious Italian food you’d love to gorge on throughout your stay in Rome. The pyramids of Giza will welcome me with open arms. The March sun is scorching and the vast deserts might blow up sand into your eyes all the time, yet seeing the pyramids and knowing about the incredibly peculiar yet fascinating history of the Egyptians would almost feel like travelling back into time. The Great Wall of China is a spectacle of human capability and excellence. It not only fortifies China, it beautifies it too! It is a whopping 21 million meters long. Lakhs of tourists visit this place every year to experience the grandeur of human creation in the lap of nature. Final destination- The Taj Mahal-because all’s well that ends well! Smooth white marble’s sheen against the tropical Indian sun, the minarets and the pathway leading to it, strewn with emerald green carpets of grass and beautiful blossoms enhance the grandeur of the palace and make it look breathtakingly beautiful. 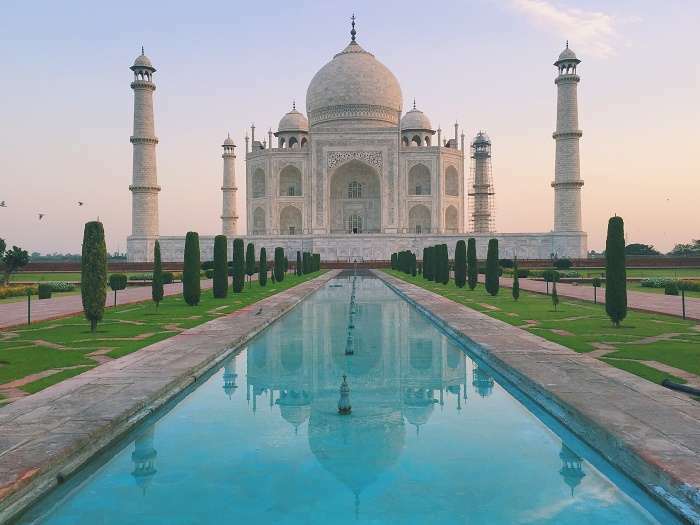 It was built by Shah Jahan in the 17th Century for his queen, Mumtaz Mahal. So you can now strike off one wish from your bucket list- travelling to the seven most beautiful sites on Earth. Though there will be more trips to come, this would surely be one of the most happening and memorable trips you’d ever be a part of. Russia Welcomes You with the Tastiest Cuisine Ever!